A good way to avoid the Black Friday madness that has engulfed our country over the last few years is to head into the countryside. 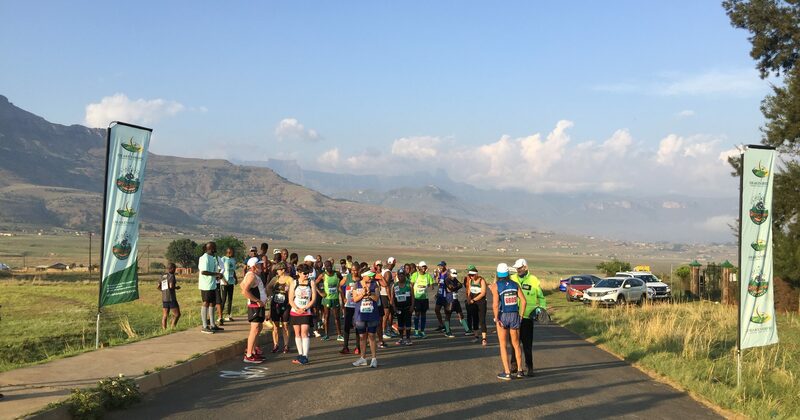 As luck would have it, a new marathon had popped onto the calendar which provided a reliable means of escape: The Josiah Gumede Marathon (42.2 point-to-point kilometres nestled into the northern Drakensburg). 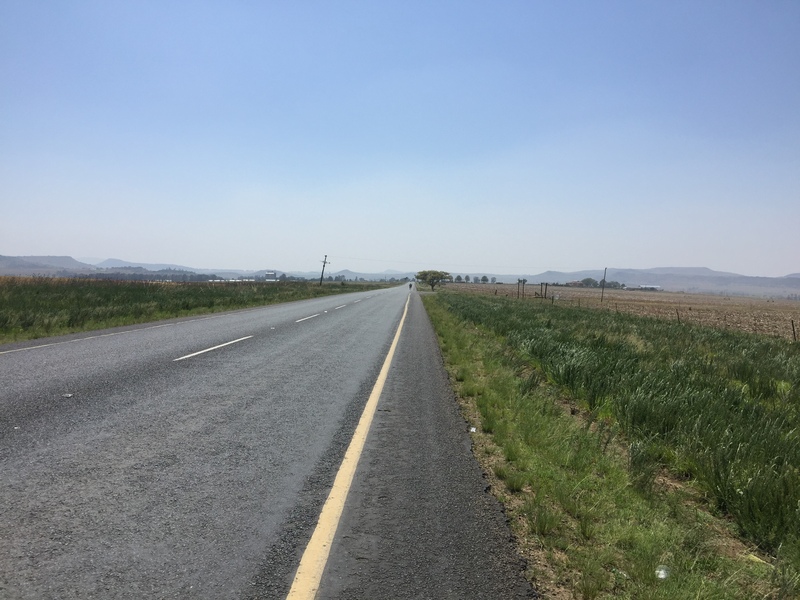 A route that is nestled into the foothills of the spectacular Drakensberg mountain range. The large body of water is the Woodstock Dam. However, when I arrived at the newly constructed Bergville Sports Centre (which looks to be an excellent facility) to register, I realised that it’s impossible to escape Black Friday’s commercial claws. 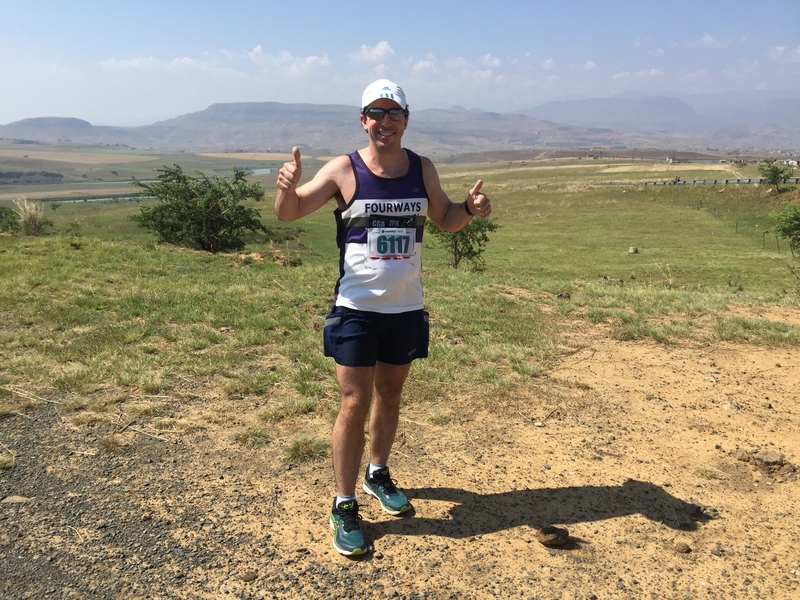 After getting my race number and a lovely shirt – a great bargain for the R200 ($15/£11) entry fee – I spotted race director Barry Holland (who together with Louis Massyn holds the record number of Comrades finishes – 46*) and popped over for a quick chat. The chat was interrupted by a constant stream of last minute questions and issues from his race team, the most urgent of which was getting enough cash for tomorrow morning’s prize winners – Black Friday had emptied all the local ATMs and every bank branch from Bergville to Pietermaritzburg (150km away) was barren. * There are very few people who’ve completed the same marathon 50 times – I was only able to find 4 (one of whom was Allan Ferguson who got 50 Jackie Gibson finishes). I thought 46 was the ultra record but it turns out that there is an American, Kimbal Byron, who has 49 finishes at the JFK 50 mile race (run in Maryland, USA). His first was as a 12-year old and he missed out on his 50th finish last year. 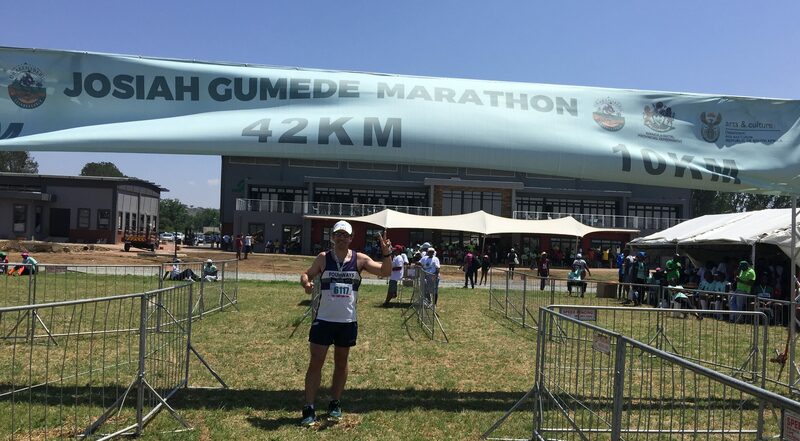 The marathon entry includes a great shirt – excellent value for the R200 entry fee. I met up with my friend Julian Karp who had managed to find us accommodation within walking distance of the start. Julian drove through from Durban which is a short 2.5 hour drive (the drive from Joburg is slightly longer at 3.5 hours). 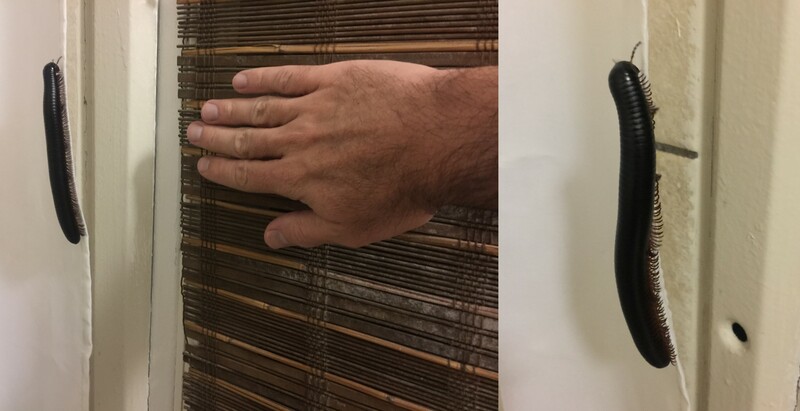 Kwazulu Natal is known for the size of their bugs and I soon discovered the unit was already occupied by a vicious shongololo (known as millipedes in the rest of the world) – this one looked very hungry and was ready to pounce from the shower curtain onto an unsuspecting victim. If Alfred Hitchcock knew about shongololos he could have made the Psycho shower scene a lot scarier. If there is a restaurant in Bergville, we were unable to find it and had to choose between KFC and Maxis (I went for the lesser of two evils and got the Black Friday two-for-the-price-of-one Maxis burger special). 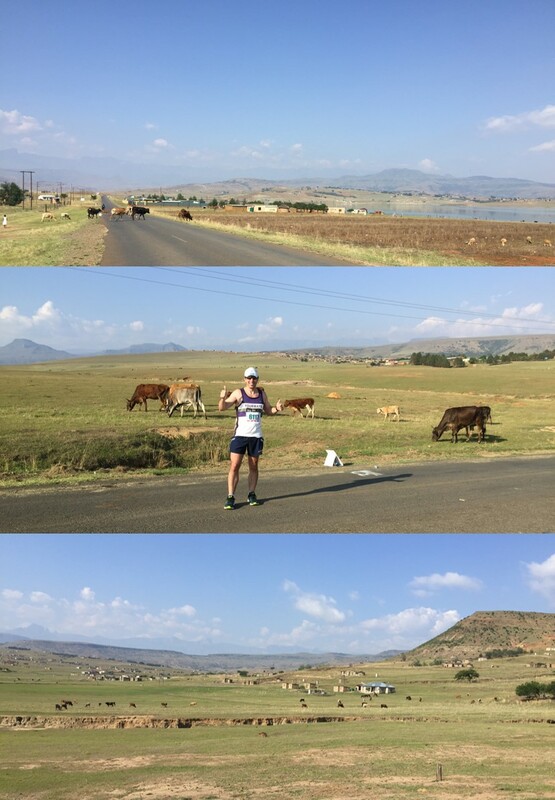 I figured it was appropriate to eat a burger in Bergville (but it does mean I’ll probably go hungry if I ever run a marathon in Kokstad). 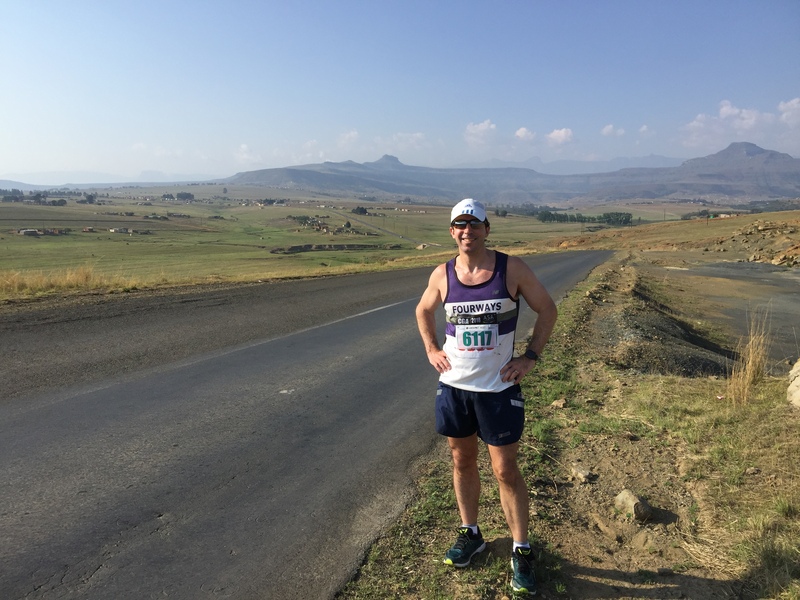 Despite having run over 750 marathons, Julian Karp still gets excited about running a new one. At the end of our drive we discovered that this was pretty much in the middle of nowhere – albeit a very beautiful middle of nowhere – and there was plenty of time to complete the pre-race routines after hunting down a loo with a view (and no queue)*. 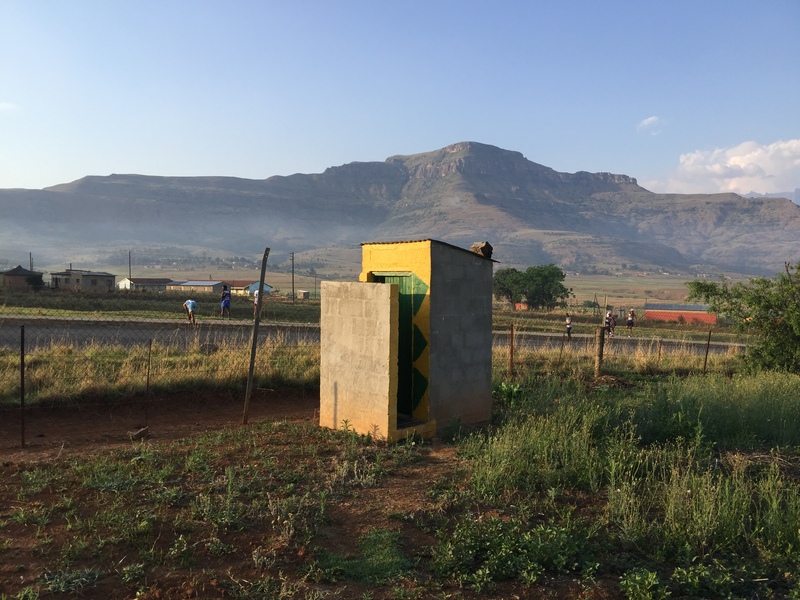 For the record it was a ‘Francois Steyn’ toilet (that’s a long drop for those who don’t follow rugby). * A full stomach is recommended to start most adventures but marathon running is a notable exception. 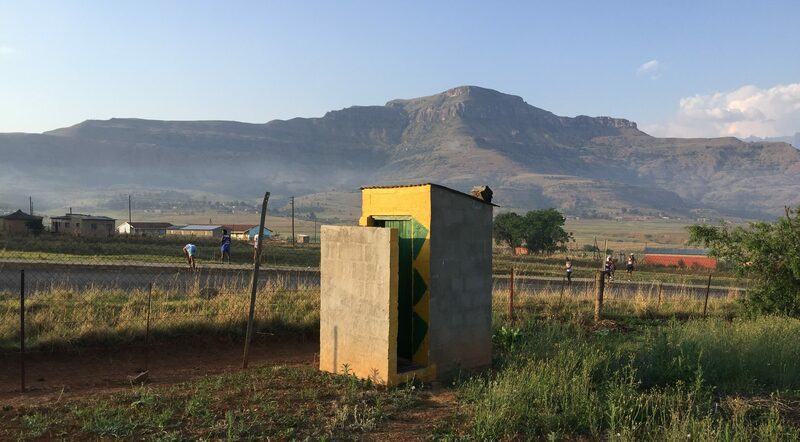 A loo with a view (and no queue). 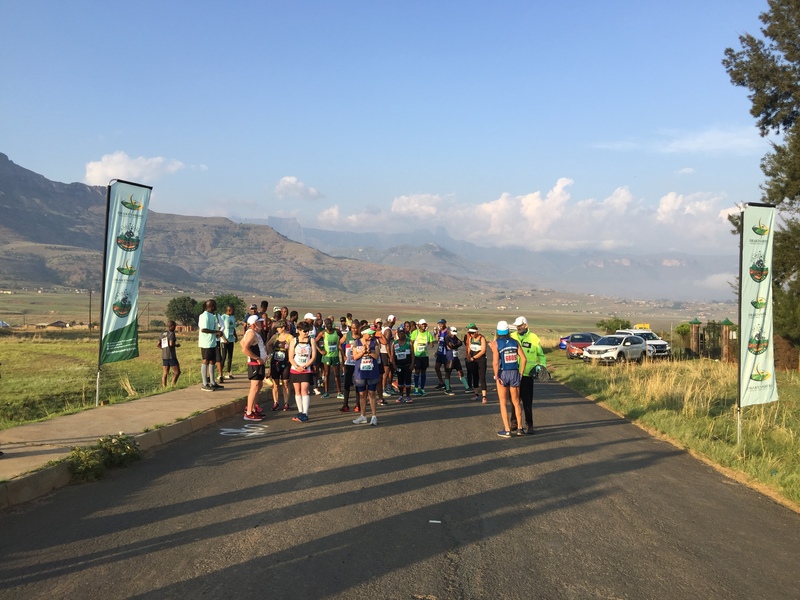 I joined the other 53 runners on the start line and we all looked forward to a scenic run through the foothills of the majestic Drakensberg mountain range. Just 54 runners got to enjoy this magnificent start line. You see some interesting things when you travel to remote places and the mysterious “Old Aeroplane” was one of them. I did a bit of digging after the race it turns out that the structure is in fact the ‘helifish’ house created by (and home of) local artist Sibusiso “Punch” Mbhele. A unique site near the start – the old aeroplane or ‘helifish’. Punch was 17 when he saw his first plane and this has inspired his lifetime passion of creating aeroplane art from scrap metal*. You can read more about this fascinating artist here, here and here. 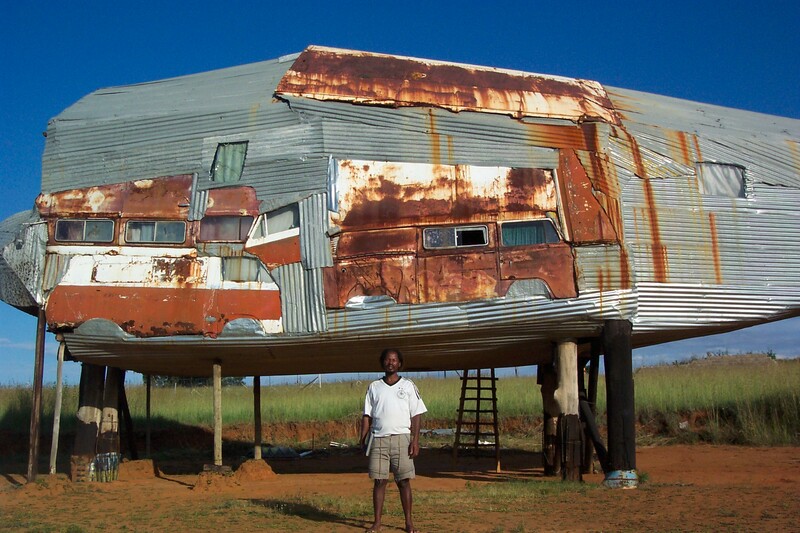 * I guess the artist’s equivalent of ‘eating your own dog food’ is living in your own scrap metal sculpture. This is a lovely part of the world to run through. 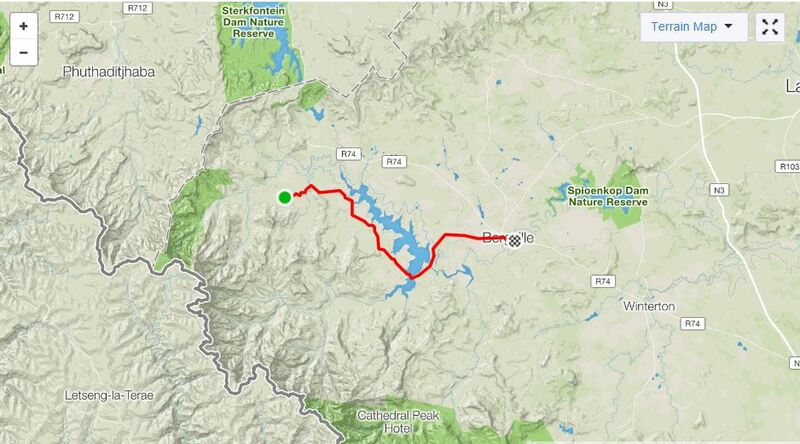 The route allows you to take in the natural beauty with an easy 4km downhill start. But, just in case you do start running too fast to appreciate your surroundings, the brakes come on with a nasty 2km climb directly afterwards. 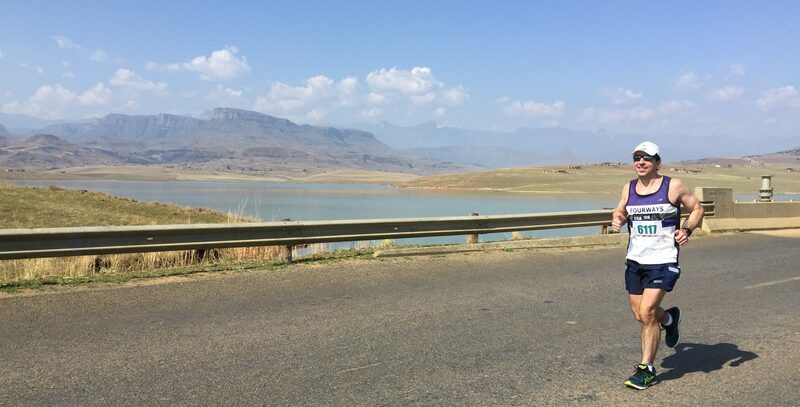 The Woodstock Dam (the 10th largest in the country with the ability to pump water uphill to Gauteng – check out more dam fine facts below) comes into view shortly thereafter. By this stage the small field had already dispersed, and the dam provided the only company for the lonely marathon runner for much of the route. The Woodstock Dam provides company for the lonely runner for much of the route. 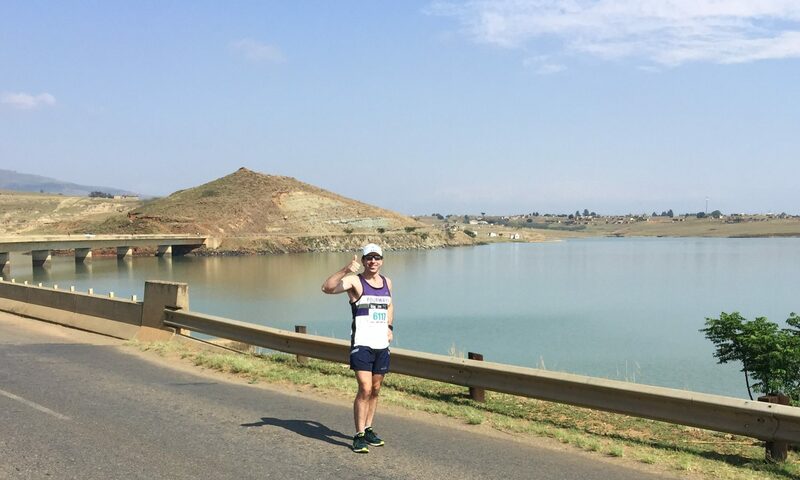 Jan Brink is an Independent Dam (and Dam Safety) Engineer who tweets about dams, water, environment and sometimes running. He runs for the Kapoen (Outeniqua Harriers) and we met for a beer after the Outeniqua Marathon (a definite bucket list marathon). I now frequently tap into his knowledge whenever there is a dam involved in a marathon (which is a surprisingly frequent occurrence). You can follow Jan on Twitter here. 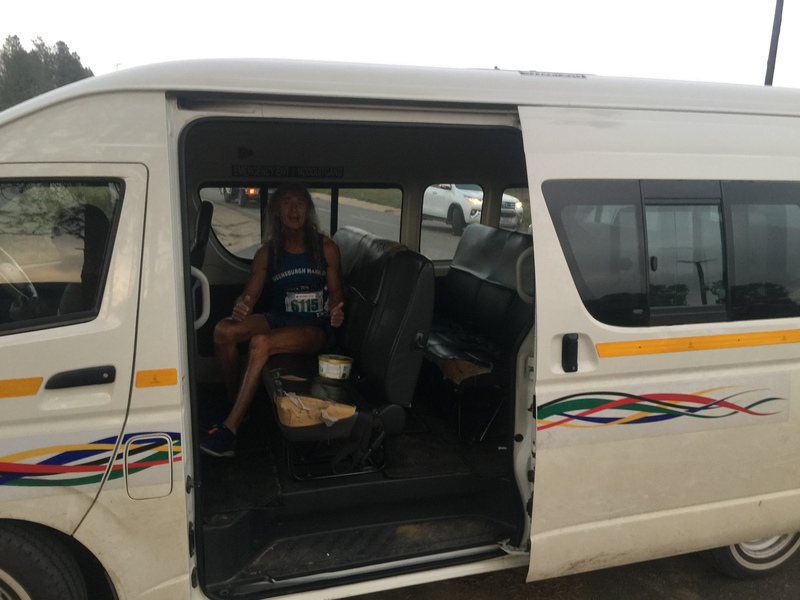 Inaugural marathons can sometimes be chaotic – and I always expect a few teething problems. However I am pleased to report that this race would have got the ‘all clear’ on a dental check-up. Everything was perfect and the support tables, positioned precisely every 3km on the route, were well-stocked with cold water and Coke. I know the plan is to grow this race so hopefully the excellent organisation can scale with what is sure to become a popular race. One of the well organised water points. Josiah Tshangana Gumede (1867 – 1946) was the fourth president of the African National Congress (ANC). He was a struggle hero who spent a period of his life teaching and farming in Bergville. Here is a really good article detailing his fascinating life. 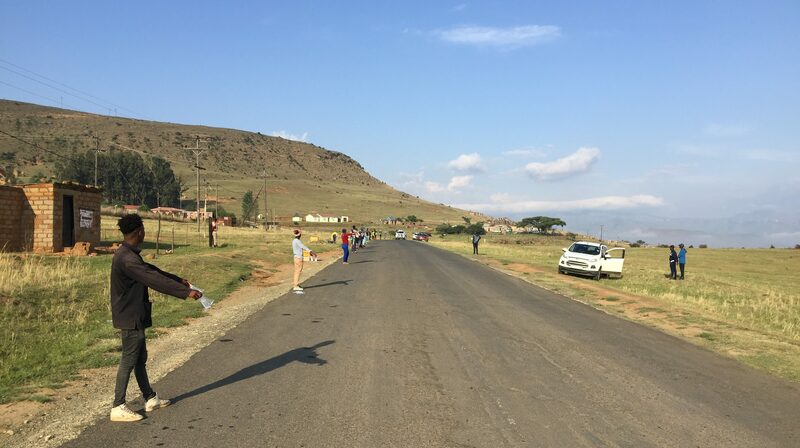 Although there were not many other runners to chat to, some curious villagers voiced their support along the way (although the local free-range livestock paid the runners little attention). Some of the views and livestock along the route. I started having a running conversation with the same set of supporters whose runners were slightly slower than me. After asking them to take a couple of photos they got into the swing of things and ensured that they pulled their car over and waited for me at the most photogenic spots on the route. They even proactively did a special scouting mission to ensure they positioned themselves at the prime location to get the best of the dam wall crossing (around the 25km mark). 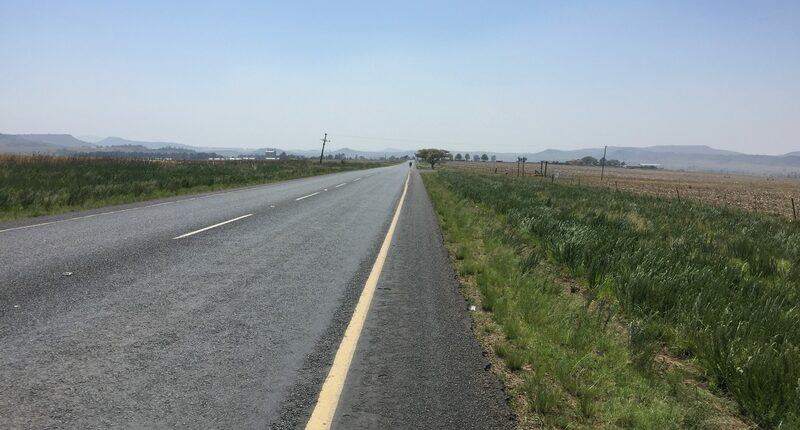 After an undulating middle section, a vicious hill suddenly appears between 29 and 32km. Unfortunately, this meant I lost photographic support as my grinding low gear ascent separated me from the chasing pack*. 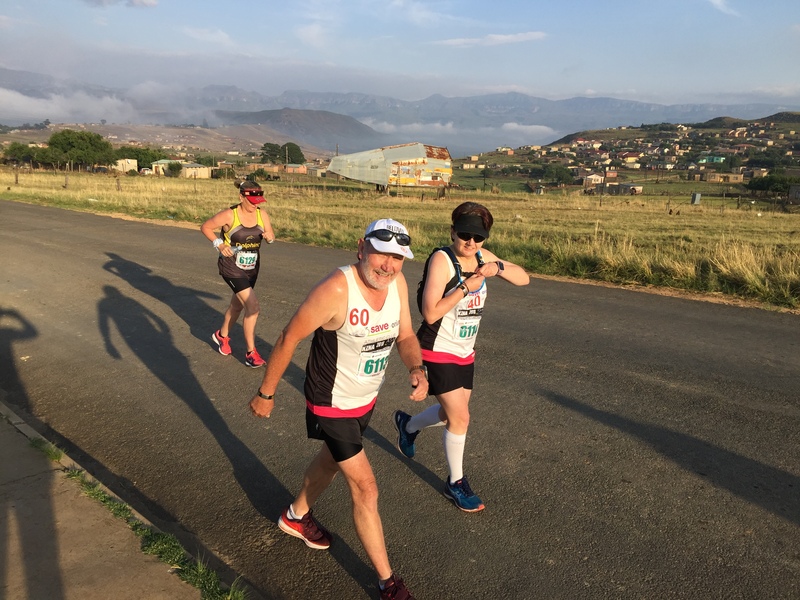 * I think I only saw two other runners on the second half of the race, both of whom I am pleased to say saw the back of me as I overtook them on the downhill back into Bergville. It was a long and lonely road home. If you look carefully you can spot the only two runners I saw on the second half in the distance. Luckily, I did manage to locate another willing photographer at the top of the mountain who eagerly fired off about 50 shots from every angle. My favourite one is below. Your reward for reaching the top is an easy 10km downhill drop into Bergville. My assault towards the finish line was halted with 2km to go for a quick photo break after hitting the city limits and marking my return to civilisation. 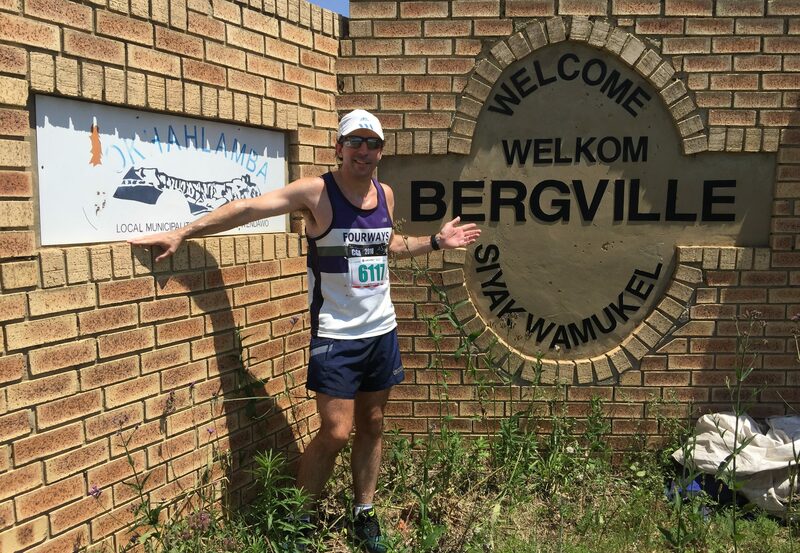 From there, I flew through to the stadium – getting “Running Manned” by the announcer as I rounded the field for the final dash to the finish line (you know you’re famous notorious when they know you in Bergville). I took a quick moment to savour my 200th marathon finish* (132 standards + 68 ultras) before having a quick shower and heading back to Joburg. * My personal preference is to keep milestone races lowkey. My 100th marathon was in 2010 at De Vlakte Marathon which is a small marathon in the Western Cape (starting in Heidelberg and finishing on the beach at Witsand). How does one celebrate a 200th marathon finish? By entering another race of course! Unfortunately, marathons are scarce at the end of the year (I would have to wait two long weeks for my next marathon) so I did the next best thing and took a minor detour on the way home via Old Parks and entered one of my favourite short distance races (the 32km RAC Tough One the following day). 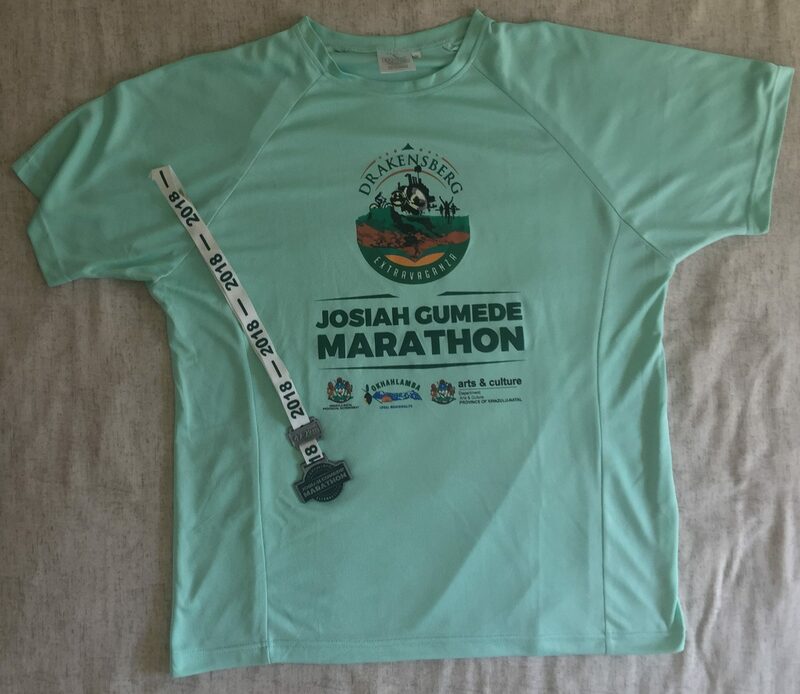 The Josiah Gumede Marathon is a great new addition to the South African running calendar. I would recommend clearing a weekend at the end of November for a Drakensburg escape – it may be impossible to evade Black Friday but it’s a perfect remedy to avoid a blue Monday! Signing out from Bergville. Look out for the next report from the Prison to Prison Marathon in Worcester. Thanks Matt, I’m not really using Strava as I use an Apple Watch which is such a mission to connect to Strava. 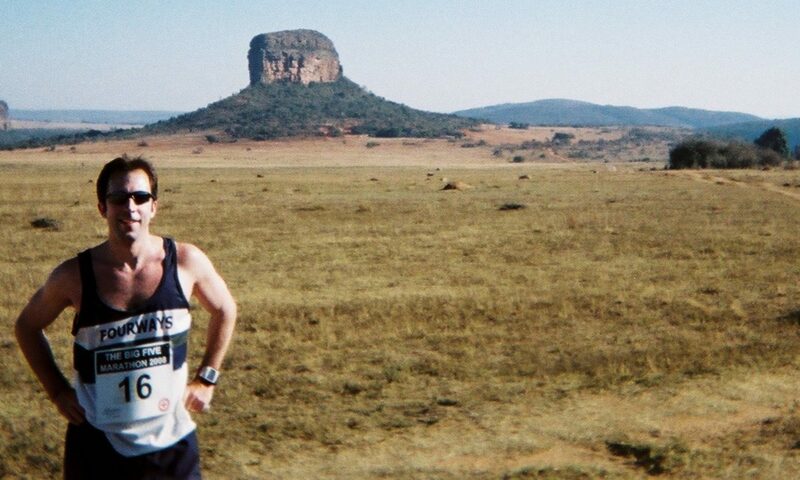 See you in Somerset East for a low key anniversary of your low key 100th unique marathon.